Models ROTARY 12, 16 and 24 soap presses are fully automatic, mid to high volume machines capable of speeds up to 400 bars/min. The newest series of our Rotary Soap Press features a vertical stamping Design with one upper and one lower die. The lower die is rotated approximately 60 degrees for bar removal. Rotary Soap Presses are available with up to 10 die cavities depending on machine size and bar size. The machine is made with all welded steel construction for distortion-free operation. The soap press drive is fully electronic and driven by a servo motor and Programmable Logic Controller. The operator can make independent adjustments for all functions on an easy to use touch screen control. The machine is easy to clean and die changeover can be accomplished in 30 minutes. Large door panels allow quick access to all working parts. All panels are interlocked for maximum safety. 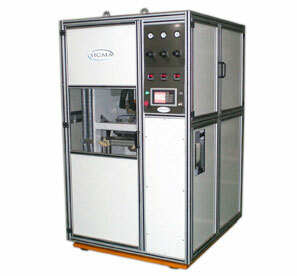 The Rotary Soap Press requires a vacuum pump which can be customer-provided or installed by SIGMA.